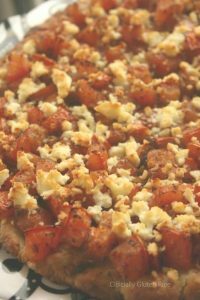 This Bruschetta with Feta Gluten Free recipe can be made on a pizza pan and cut into slices or you can make it into smaller personal sized pieces. This dish makes a great gluten free appetizer or a tasty vegetarian pizza. The Fresh Tomato Brushetta would also be great as a topping on Chicken with Mozzarella Cheese or served with Gluten Free Pasta. 1. Pre heat oven to 400 F.
2. In a large bowl dissolve the sugar in the lukewarm water. Sprinkle the yeast on top and cover with a clean dish towel. Let sit for 15 minutes. Then Stir in the rice flour and oregano. 3. Mince the garlic very small. Melt the butter in the microwave with the minced garlic in the bowl. 4. Brush a pizza pan generously with the garlic butter then sprinkle with salt. Then press the dough into the pan with your finger. Brush the top with garlic butter and sprinkle with salt. Cover with 3 Tbsp parmesan cheese and bake for 20 minutes. Remove from the oven half way and brush with the garlic butter once again. 5. Dice the tomatoes and mince the garlic. Place into a bowl and cover with olive oil, balsamic vinegar and dried basil. Mix well and let marinate for 10- 15 minutes. 6. Remove the crust from the oven and cover with the tomato mixture. Sprinkle the feta cheese on top and continue to bake for 10 minutes. Then turn your oven to broil and let cook for another 5 minutes. If you enjoyed this Bruschetta with Feta Gluten Free recipe, you may also like these recipes for Bacon Wrapped Sweet Potatoes, Crab Stuffed Mushrooms, or Mango Salad Rolls. Gluten Free or no these look delicious. Just found this site today. Everyone needs to check it out. But I bet most have and I am just late to the table. Wow I loved the recipe, so different,interesting and yummy! Well done! Here is another recipe that would be great as an appetizer or main dish. You can enjoy it with friends or savor it all by yourself. I had forgotten how much I like— and have missed— bruschetta— til I saw these photos. Thanks for sharing!